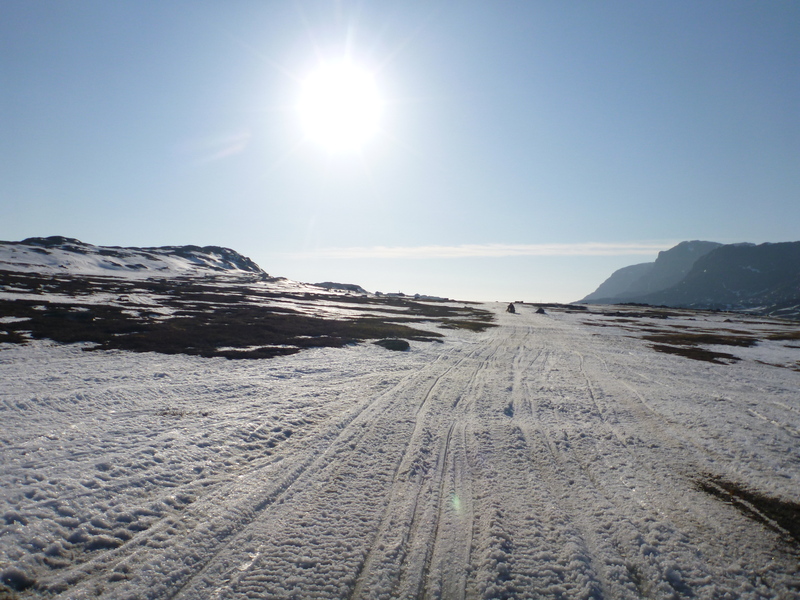 One of the big problems we encountered during this trip is that there has been very little snow this Spring in Sisimiut. 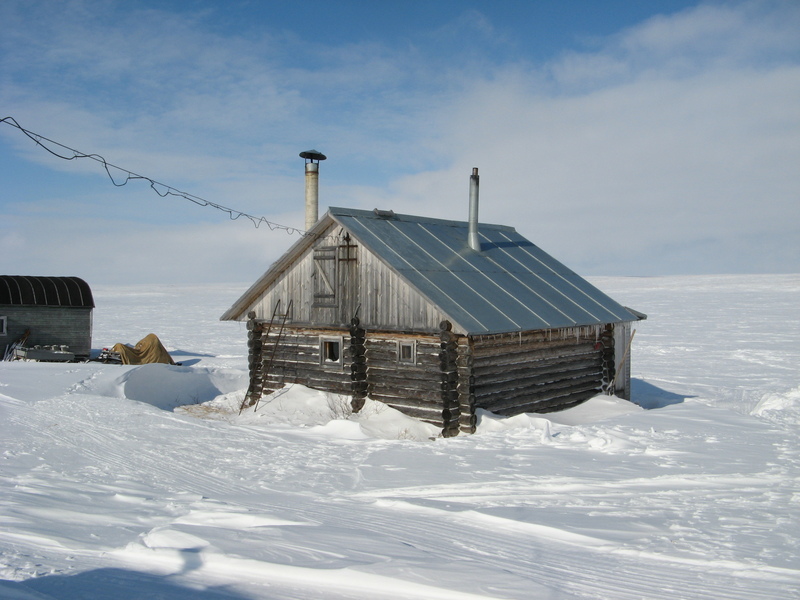 We were very fortunate that there were a few days of heavy snowfall around the time that we arrived, which meant we could drive snowmobiles from the town to access some of the lake sites that we wanted to (AT1 and AT2). 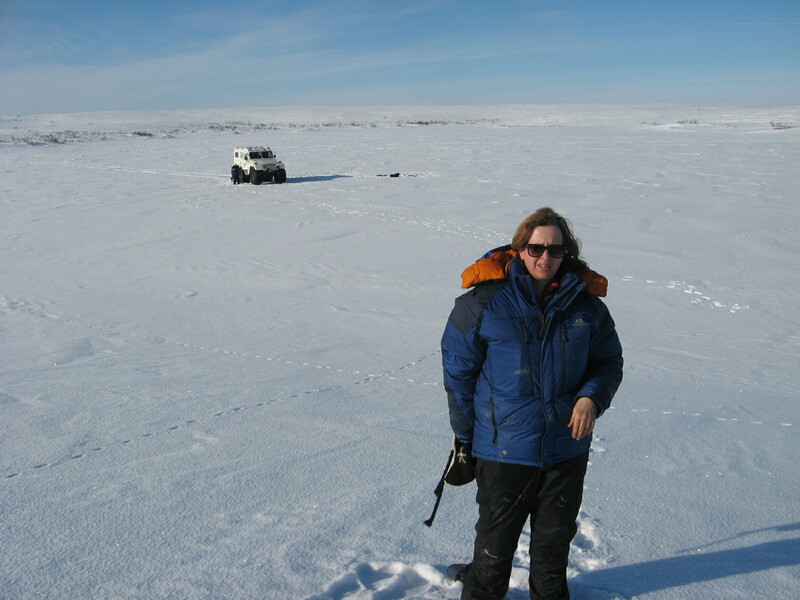 However, one of our target sites, AT7 proved completely inaccessible either by snowmobile (too little snow on the low ground) or by foot (too much snow up high). 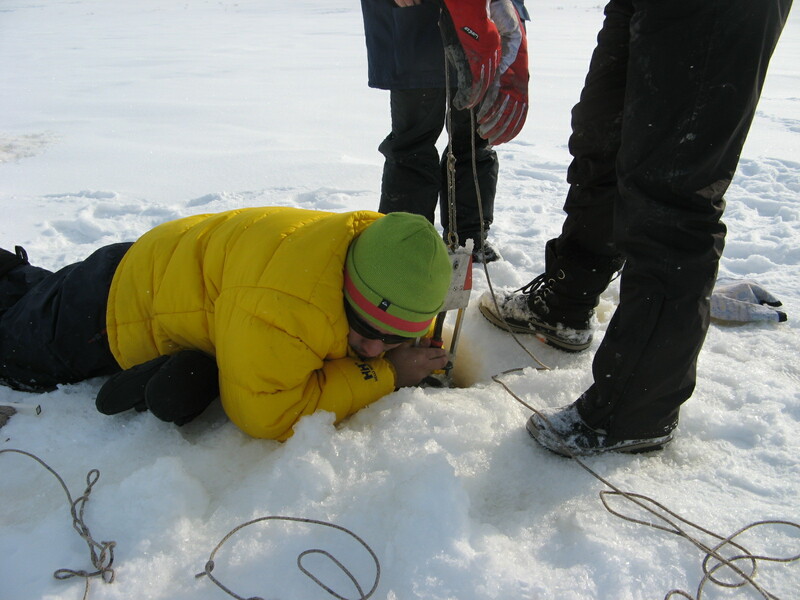 We tried to core an alternative site up in the mountains (AT3), but at 24m deep, this lake was a little deeper than we really wanted for the project and at the limits of what our coring gear could handle. 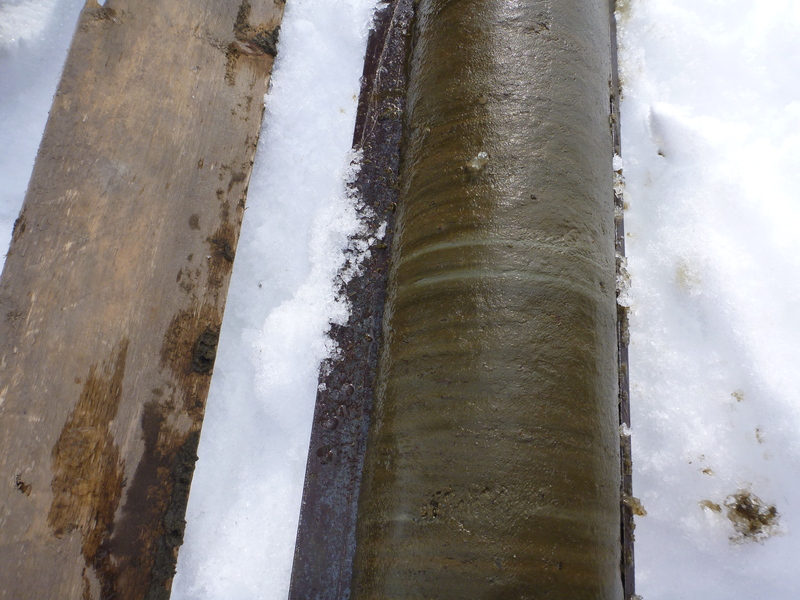 We took some exploratory cores, but they were not promising, possibly because we could not access the deeper depositional part of the basin. Here is the team taking the exploratory Russian core on lake AT3. So we decided to stick to the original plan, and will now core lake AT7 in the summer. 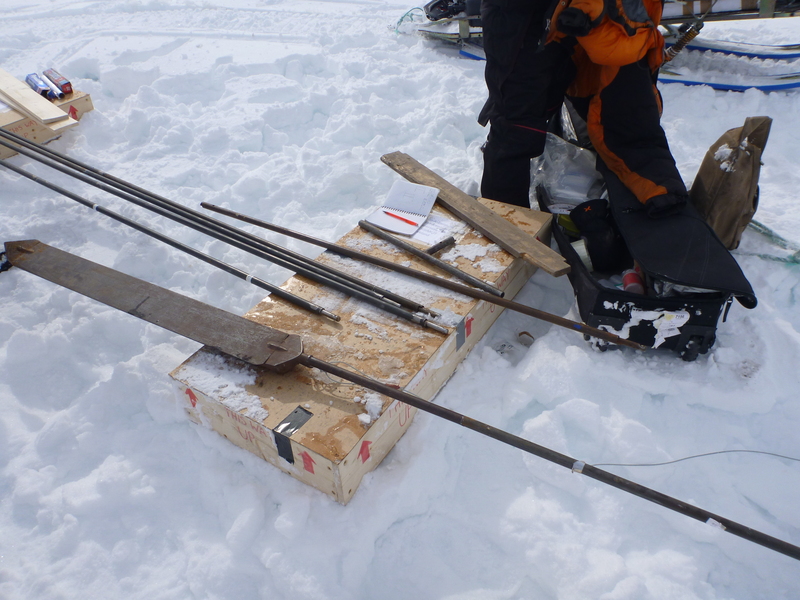 On a more positive note though, we did successfully core two lakes, taking Holocene sequences (over 2m long) using a Russian corer and using a short kajak corer to retrieve the upper less consolidated sediments. Here are the parts of the Russian corer- the rods are assembled together as it is lowered down and the barrel cuts out a semi-circular sediment core when it is turned. This is what the mud looks like when it comes up. There are some grey bands of clay-like material that probably represent periods of past catchment erosion. It is possible to make out layers in the sediment, showing that it is preserving the record of change in this region very well, with minimal mixing. 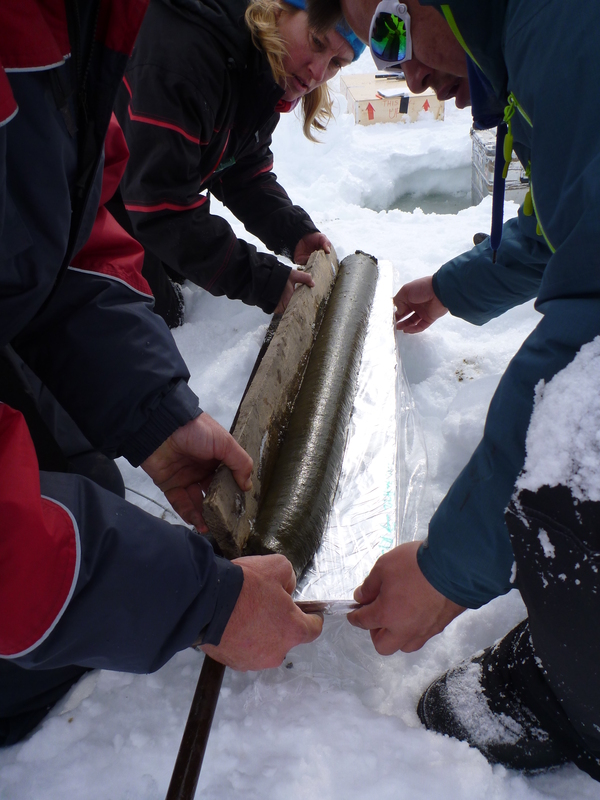 Here John & James are taking a short kajak core to sample the upper sediments. James drew the short straw and ended up being the one who had to put his hand under the water to bung the bottom of the core when it came up. But he was clearly very proud of the results. 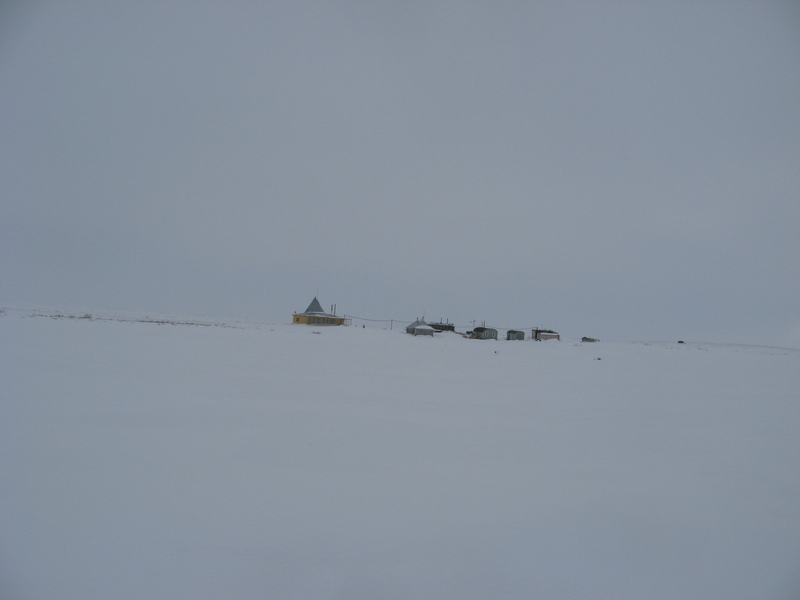 Here we are arriving back at the edge of the town, where the huskies live with our haul of mud. 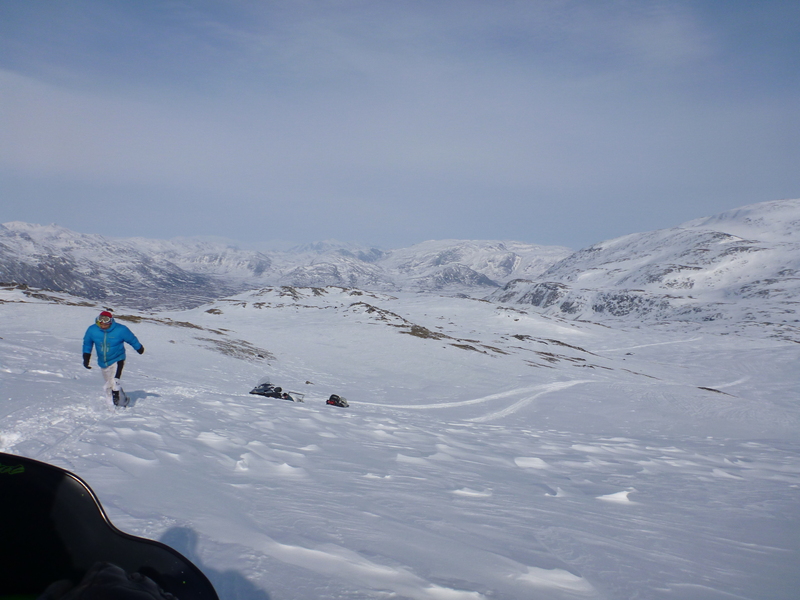 We have a team of helpers in Sisimiut who have been guiding us to our study lakes, as sometimes the snow can be a bit tricky to handle, especially when it is deep or icy or the hills are steep. 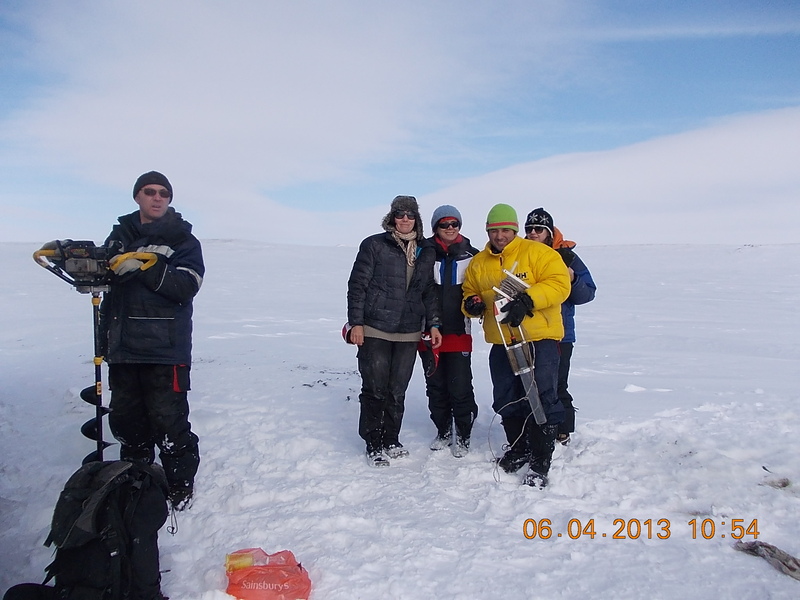 Thanks so much to Sune, Avatannguaq, Akkalu and Christian who have seen us through some tricky times and helped out with the ice drilling and sediment coring. 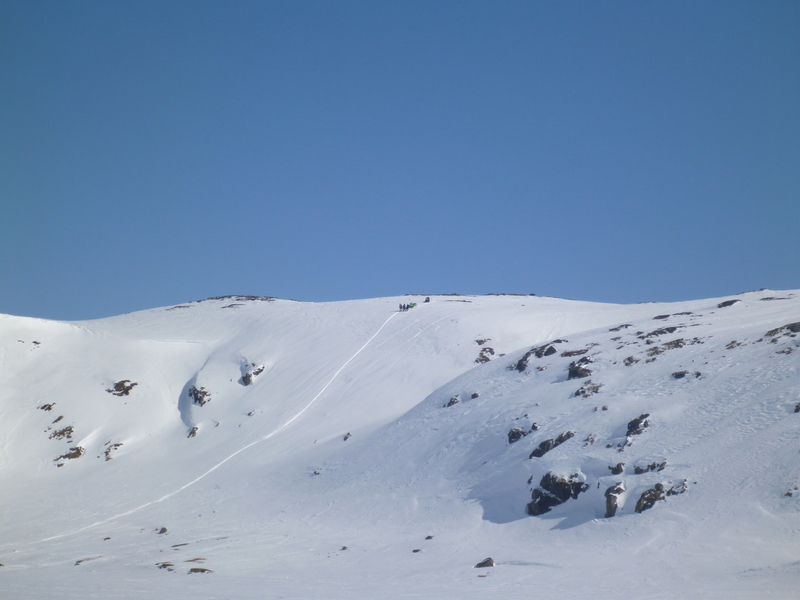 Here is Christian trying to get the snowmobiles out of a tricky slope. 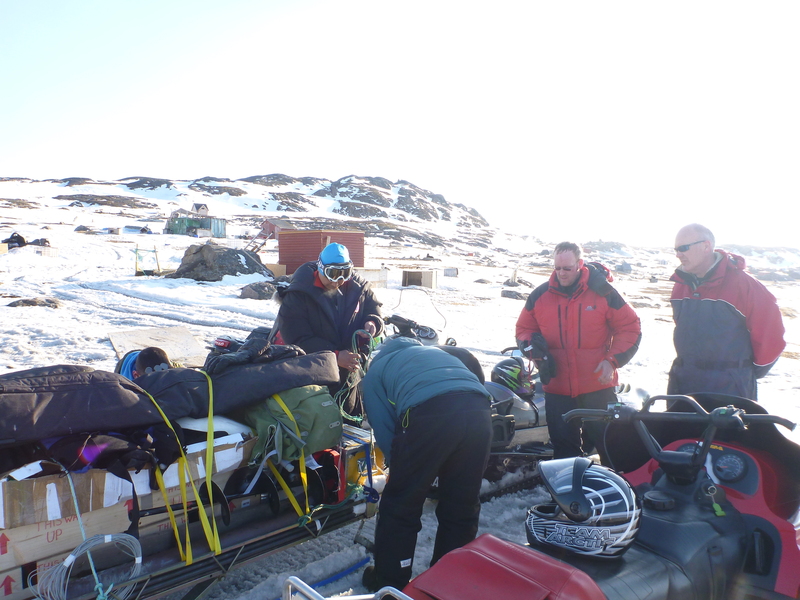 Christinan and Sune are tying the gear onto the trailer- we soon discovered that Greenlanders are much better at tying gear onto trailers than Brits (John & James are watching & learning). 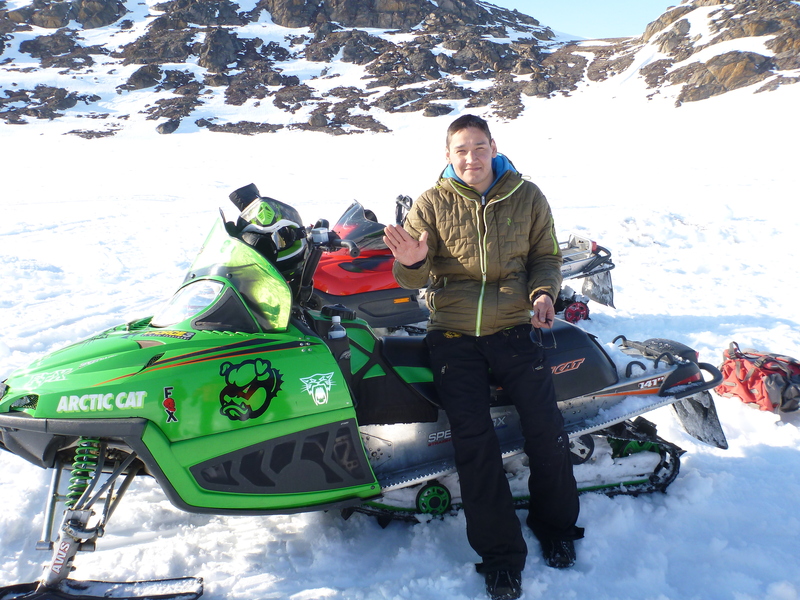 This is Avatannguaq with his ‘boy racer’ snowmobile- it is fast and light so he was racing around checking whether any of the team were stuck during the journey. 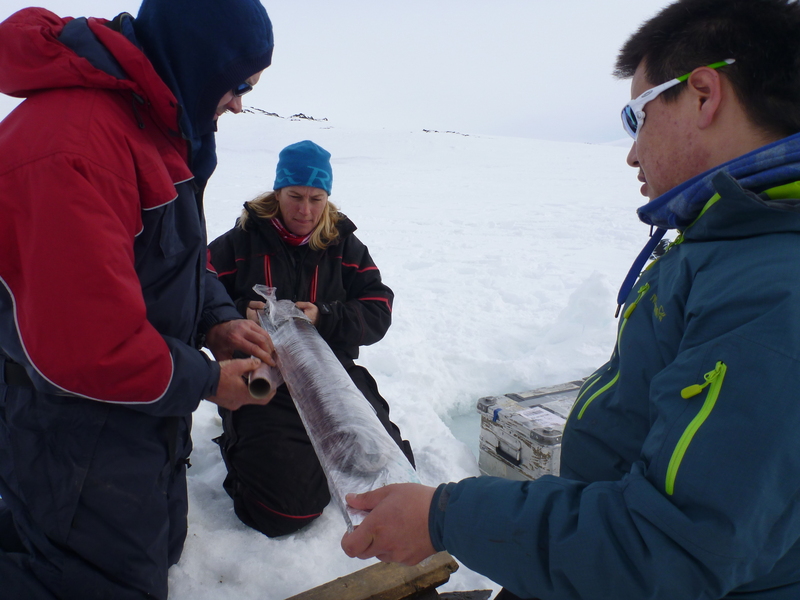 Sune, helping John and Suzanne to wrap the sediment cores. 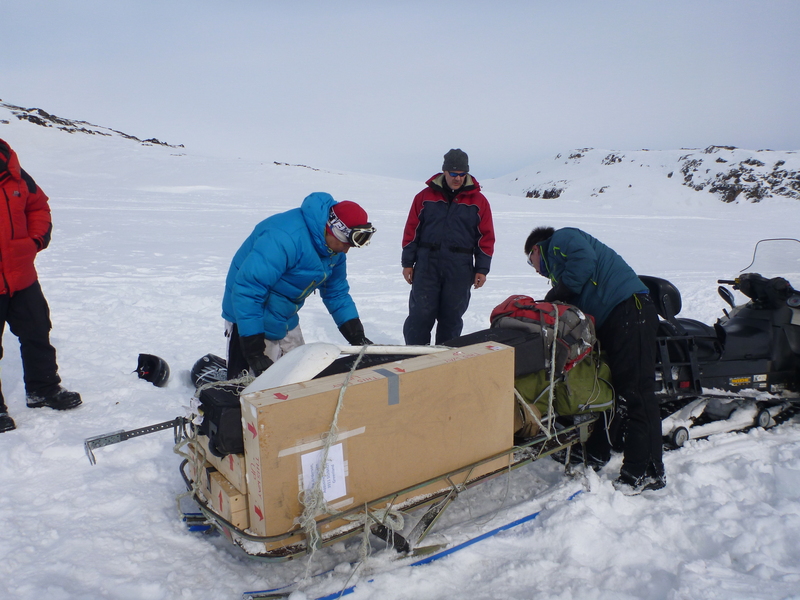 And the snowmobile stunts kept us entertained when we were extruding our short cores- believe it or not, Sune & Avatannguaq did a wheelie up that mountain. 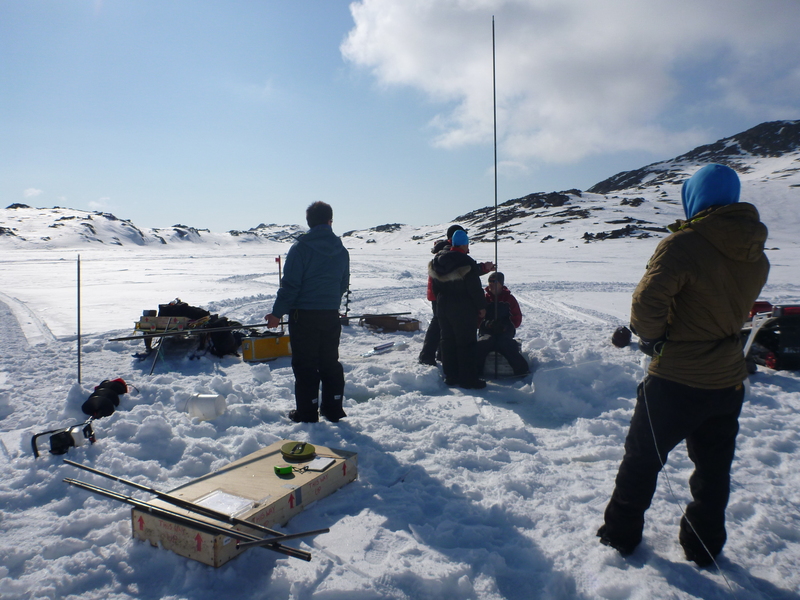 We’re ready to start the coring work in Sisimiut! 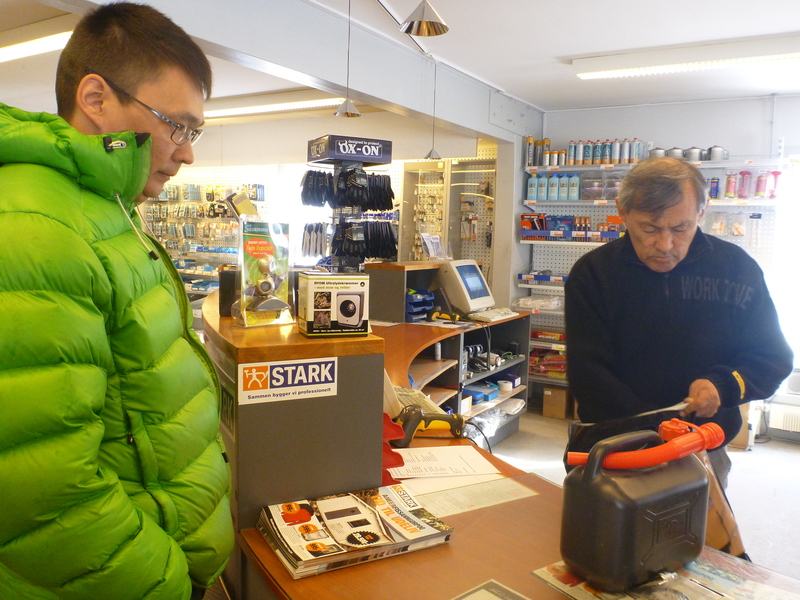 John & James flew in from Kangerlussuaq after a long plane delay yesterday because of the snow, to meet up with Suzanne in Sisimiut. 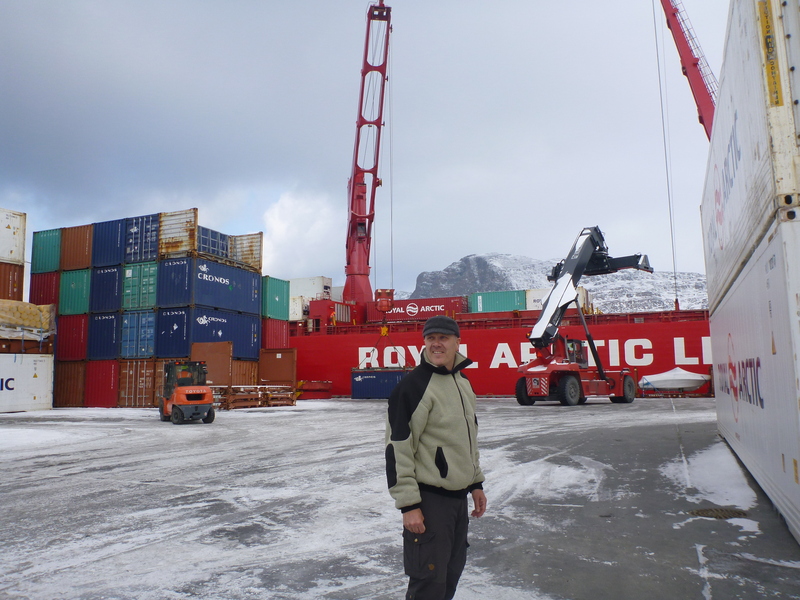 We’ve spent the moring picking up the freight from the ship which has just arrived from Aalborg. 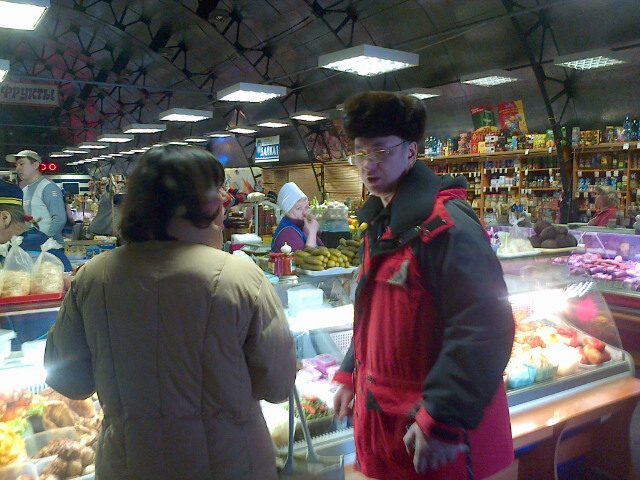 Stocking up on supplies in the local hardward store (this is Christian who has been driving us around town). 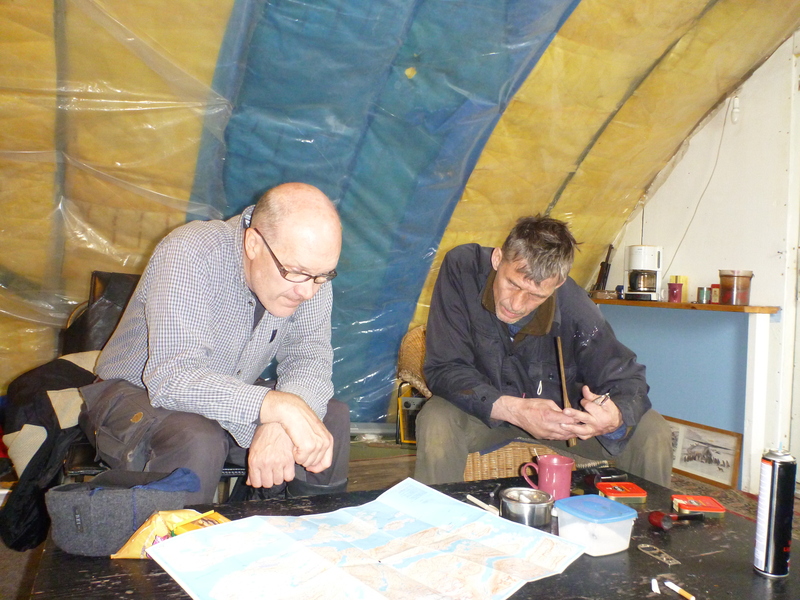 And planning the route with our snowmobile guide Kent. The snow cover was very sparse a few days ago, but we have been very lucky to have a couple of blizzards in the last few days. Hopefully there will be enough snow cover to reach the lakes that we need to get to. 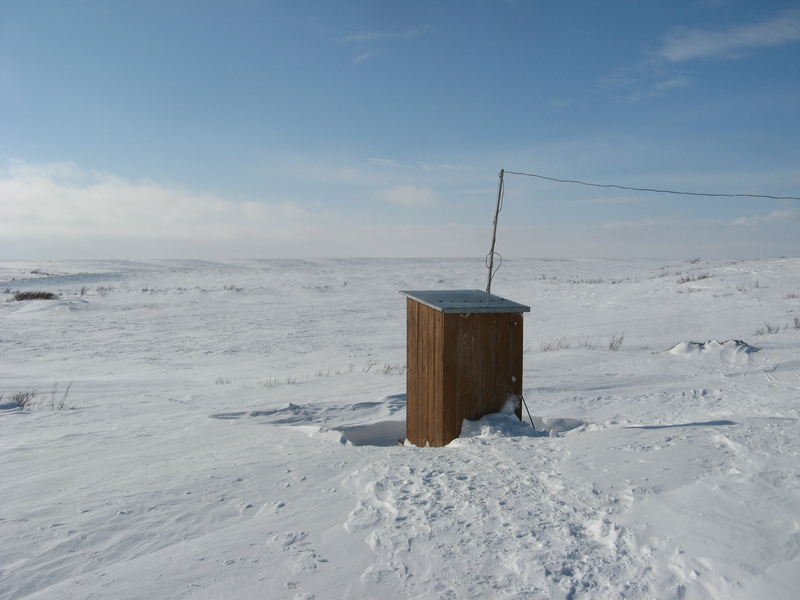 The loo (expected field facilities) – cold at times! ALWAYS make sure your student puts the bung in! 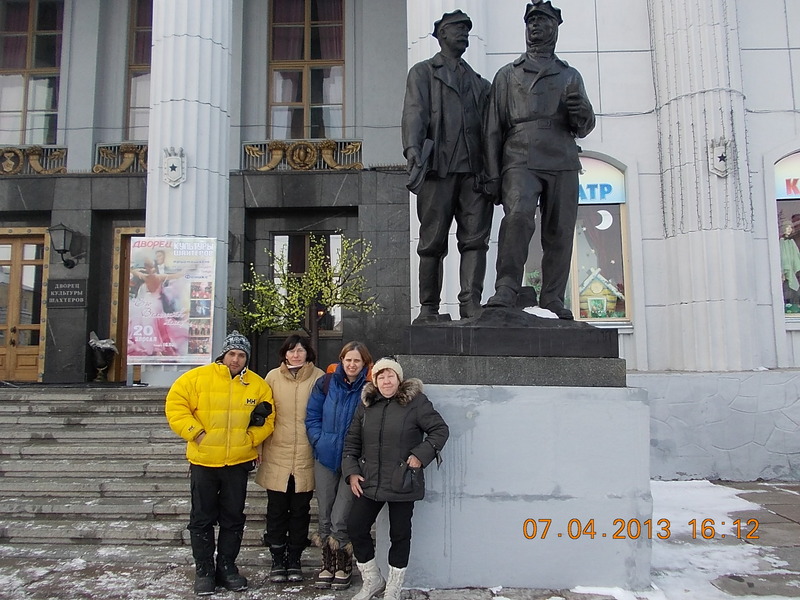 We are now in Syktyvkar the capital of the Komi Republic after a successful week or so in the field. 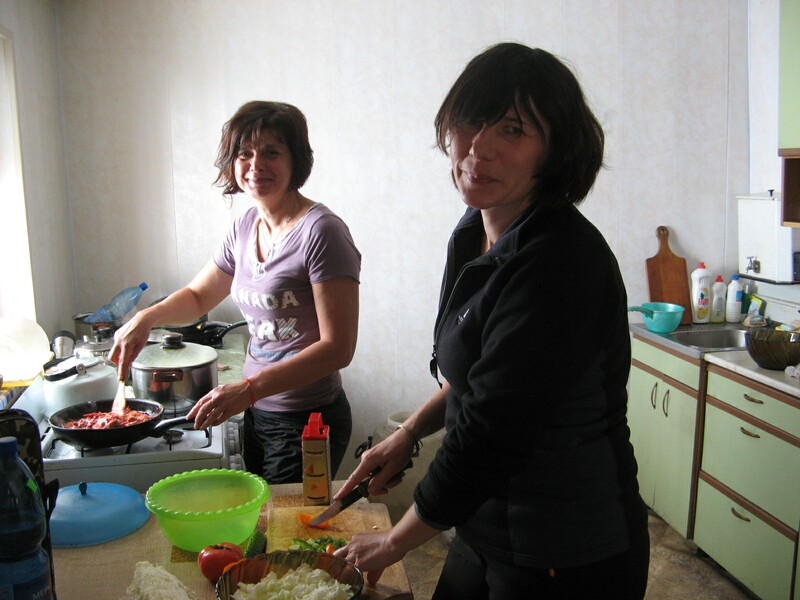 Conditions were hard; one day it was so windy we couldn’t work at all – even the schools in Vorkuta were closed and I suspect it takes some extreme conditions to close a school in a town were temperatures are regularly minus 25. We were out working in about minus 10 the main problem is that once you take the corer from the lake the water immediately freezes to it and blocks the holes so we used a butane blow torch to keep the rods and corer free of ice. 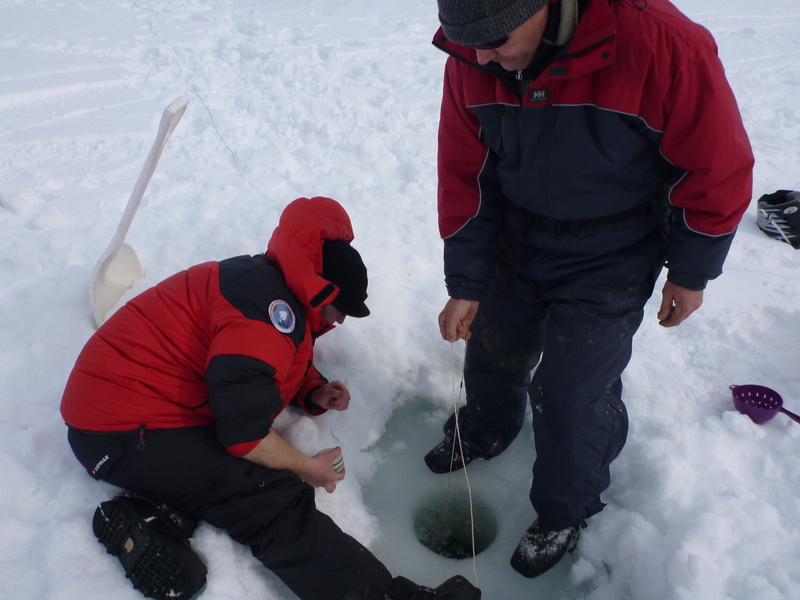 We managed to core deep water and shallow locations in 4 lakes, and take water samples. 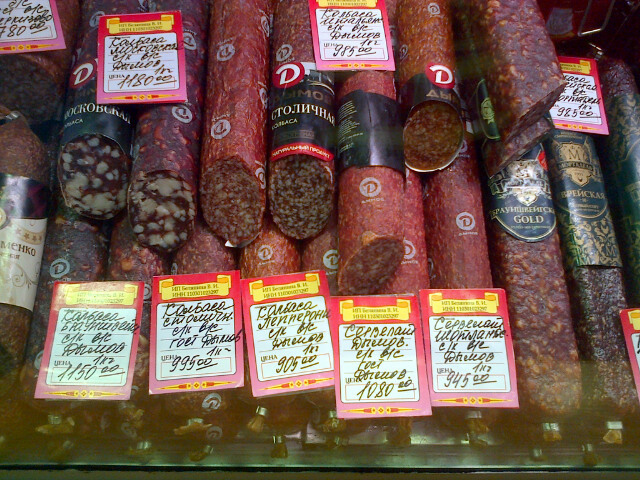 We are now sitting in Syktyvkar waiting for the samples to clear customs. This involves them, at least in theory, taking photographs of the circa 1500 sample bags. That’s all for now – just hope we can get the correct paperwork and we will be on the way home. We finally arrived in Vorkuta after a 2 day train journey from St Petersburg but hopefully will travel to the field sites later today after we have negotiated the hazards of registration with the police. 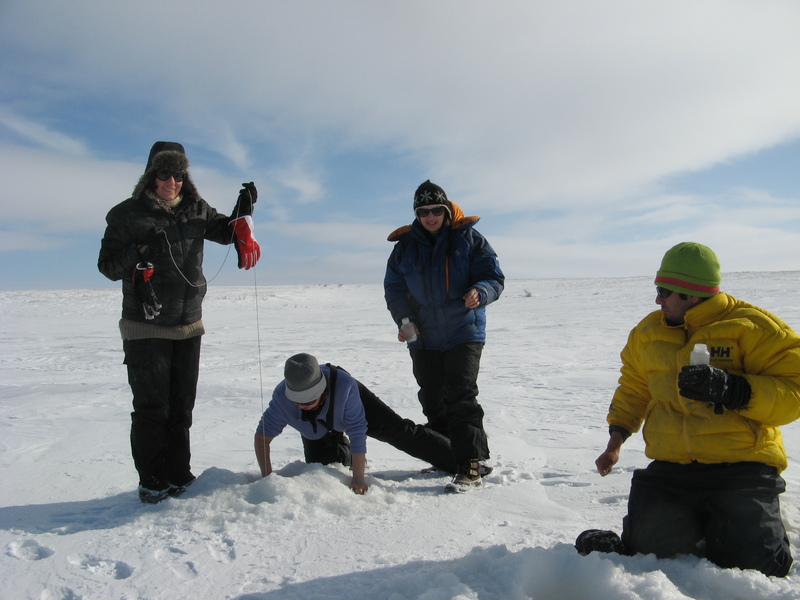 We are heading to an area about 60 km east of Vorkuta were there are plenty of lakes and were we have worked before and know at least some of them have good sedimentary records. 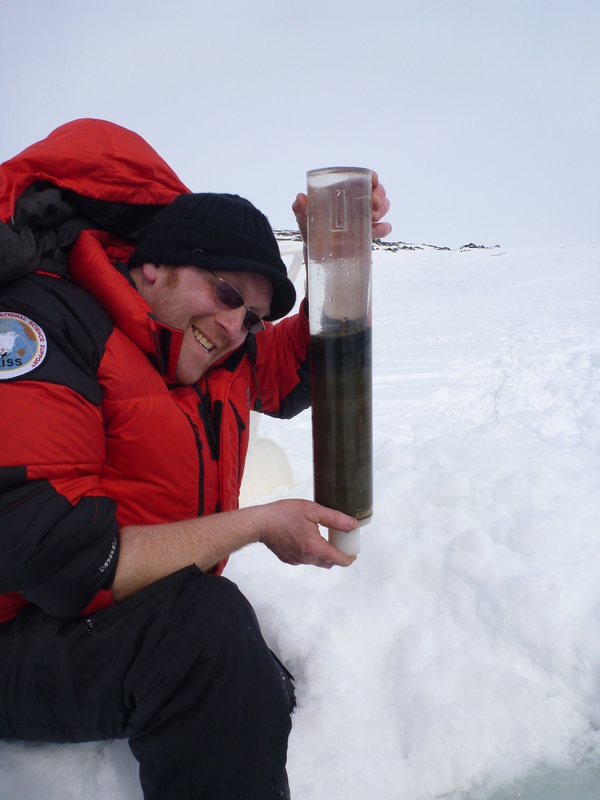 Apart from the cold, it is minus 15 today, the main problem will be identifying good lakes for coring since there are many lakes which have been affected by the permafrost, these thermokarst lakes are disturbed and the sediments are mixed so we will try and avoid.